We are small independent real estate brokerage that respects your privacy, and works to your exact personal instructions. Our locally based agents on each island offer extensive knowledge and years of experience for all your realty and development needs on Middle Caicos, North Caicos, Pine Cay and Salt Cay. The Turks & Caicos Islands has no property or income tax, no probate fees or succession duties and a well established offshore financial services sector – making investment here a secure long term decision of exceptional value. 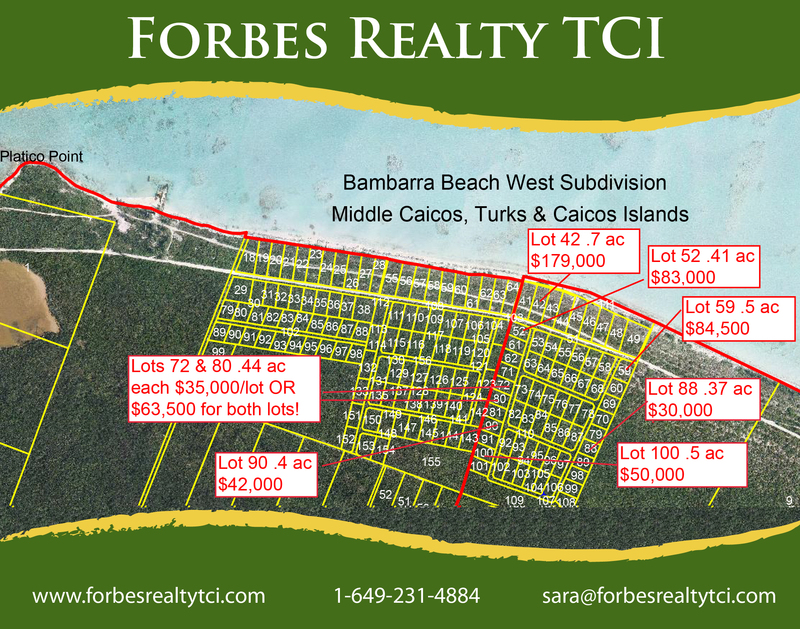 Both vacant land parcels and homes are currently listed with Forbes Realty TCI, on each island. In addition to property sales we also handle land claim research, property development logistics, rental property management and more. Come visit soon! 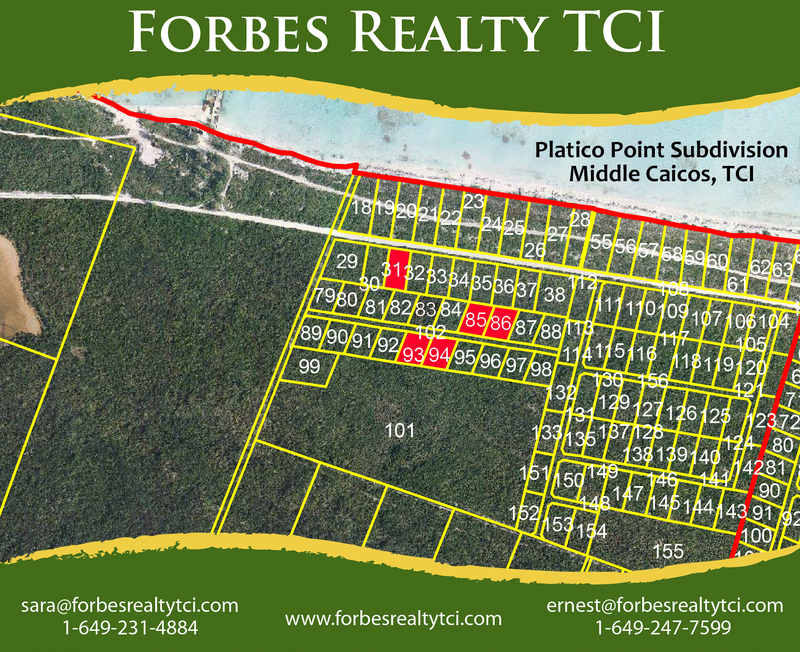 Forbes Realty TCI is an independent real estate broker licensed in TCI and a member of the AIPP/UK. We invite you to “Go Beyond Provo!” and welcome your enquiries anytime – contact us at 1-649-231-4884, or info@forbesrealtytci.com. This is the original Middle Caicos subdivision created in 1988, situated along the curve of gorgeous Bambarra beach.The lots for sale include parcels in the sandy ground just moments from the beach, lots on the hillside overlooking Montpelier Pond and ridgetop lots on the Kings Road with spectacular views and breeze. Residential lots for sale from $22,500 to $95,000!! Click here for a description of available listings. Located just five minutes east from the village of Conch Bar this is a fully laid out development, power infrastructure in place, paved roads lead off the main island route. Open land with the island ridge at the south, and best of all, a dedicated public beach access three minute walk from the lot. A boat ramp has been planned. Lots available from $30,000 to $100,000. Click here for a subdivision map. This is a well structured development with hard pack roads, large open space and community garden. The first house is almost completed and public beach access is directly across the road at Platico Point where a special beach cove awaits. Located just off the main paved road in central Middle Caicos with superb breeze. Properties are an excellent price for investment/retirement or vacation rental homes. Click here for an aerial map of lots for sale.